Imagine if Vauxhall were to become home to a world-class museum. What would that do for the image and prosperity of the area? Well, it turns out, that’s what could have happened. Vauxhall nearly got the National Railway Museum, but it went to York instead and is now the most-visited museum outside London. After the nationalisation of the railways in 1948, it was decided that a co-ordinated approach to managing the nation’s growing collection of railway memorabilia was needed. Three years later, the British Transport Commission, an organisation created by Clement Atlee’s post-war Labour government to oversee railways, canals and road freight transport, produced a report which recommended that, among other things, a museum for larger railway memorabilia such as locomotives should be established in London. On the back page of the paper is an illustration of the building from a contemporary engraving. “In January 1951 the British Transport Commission’s committee on relics and records proposed Nine Elms station as a museum for larger railway memorabilia. Six years later in 1957 the British Transport Commission’s Relics and Records Committee concluded that because Nine Elms had since become part of Southern Region’s goods depot it was unlikely the site would ever become available for storage or museum purposes. Instead four years later in 1961 British Railways opened the Museum of British Transport in a former bus garage in Clapham. This joined BR’s other railway museum in Queens Street, York, which was originally created by the London and North Eastern Railway (LNER) in 1927. In 1963 the Beeching Report recommended that BR should give up its loss making museums altogether. BR was encouraged, by the subsequent 1968 Transport Act, to work with the Science Museum to develop a National Railway Museum (NRM) to house the railway memorabilia collection. The railway museums in Queens Street, York, and Clapham were closed in 1974 and 1973 respectively and in 1975 the NRM opened in Leeman Road, York. London’s transport memorabilia was moved initially to Syon Park, Brentford, before moving to its present more central home in the London Transport Museum in Covent Garden’s old flower market. Today the NRM is one of the most popular railway museums in the world, attracting some 800,000 visitors a year. It is, in fact, the most visited museum outside London. Its presence in York has enriched the city culturally and materially immensely. A Yorkshire Tourist Board report estimates that the museum generated more than £32 million pounds’ worth of additional tourism expenditure in York in 2007 – seven per cent spent within the museum itself and 93 per cent outside. There are no separate turnover figures for the railway museum itself because it is part of a group of museums, the National Museum of Science and Industry (NMSI), which includes the Science Museum and the National Media Museum, which reports figures collectively. Income for all three in 2009-10 was £65.5m. Incidentally, Nine Elms Lane and the surrounding district took its name – in the mid 17th century – from a row of trees bordering the road. A swampy, low-lying area prone to Thames flooding, it was dotted with windmills, willow beds and pollarded trees. It resembled, so it was said, a Dutch pastoral scene. 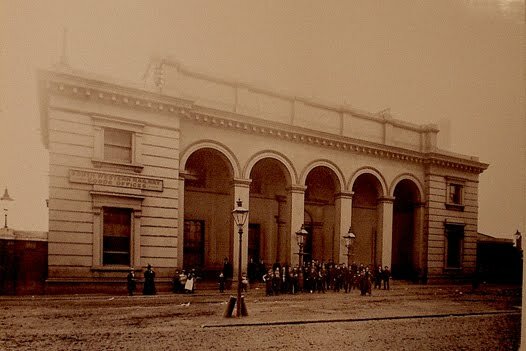 Nine Elms railway station, a neo-classical building designed by Sir William Tite, at the Vauxhall end of Nine Elms Lane, was opened in May 21 1838 as the first London terminus of the London to Southampton railway line built by the London and South Western Railway (LSWR). Passengers travelled on to various destinations in central London by steam boat. 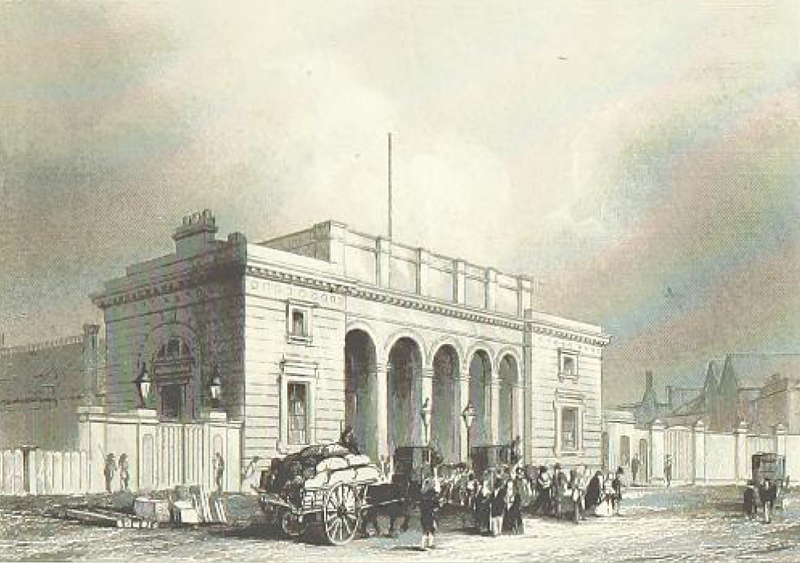 The station closed to passengers a decade later when a new terminus was established at Waterloo. The Nine Elms station continued to be open to freight (goods trains) and its surrounding site became a huge railway yard where LSWR built and maintained carriages, wagons and locomotives. This work relocated to Eastleigh, Hampshire, in 1909. Nine Elms station was quite badly damaged by bombing in the Second World War and was demolished in 1974. The site then became home to the New Covent Garden flower market.